The Potsdam Declaration or the Proclamation Defining Terms for Japanese Surrender is a statement that called for the surrender of all Japanese armed forces during World War II. On July 26, 1945, United States President Harry S. Truman, United Kingdom Prime Minister Winston Churchill, and Chairman of the Nationalist Government of China Chiang Kai-shek issued the Potsdam Declaration, aka the Proclamation Defining Terms for Japanese Surrender. It was a statement that called for the surrender of all Japanese armed forces during World War II as agreed at the Potsdam Conference, the ultimatum stating that, if Japan did not surrender, it would face "prompt and utter destruction." 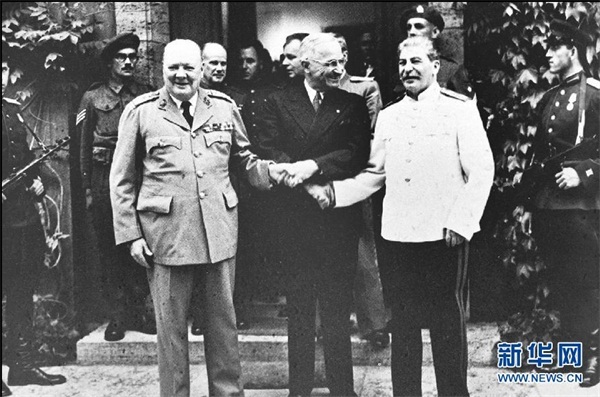 Winston Churchill (L), Harry S. Truman (C) and Joseph Stalin (R) at the Potsdam Conference in July 1945. The Potsdam Declaration, which outlined the terms of surrender for Japan during World War II in Asia, was issued on July 26, 1945. Although the Japanese Government did not disclose the ultimatum to the Japanese populace, the declaration was broadcast by American radio picked up in Japan and American bombers dropped leaflets. The result was that most of the Japanese population knew of it. Although it is clear that the word was intended in the former sense, it was translated for the Americans in the latter sense, who responded by nuking Hiroshima and Nagasaki 10 days later. Baseball player Willie Ramirez, 18, was rushed to a Florida hospital in a coma in 1980. His family, who spoke only Spanish, described Ramirez as “intoxicado” (poisoned). But an interpreter (reportedly a bilingual hospital employee) said the patient was “intoxicated.” The doctor diagnosed Ramirez to have suffered from a drug overdose. Days later, it was discovered that he actually had a brain hemorrhage. But it was too late and Ramirez became a quadriplegic because of the wrong interpretation and consequent delay in treatment. Ramirez received USD 71m in a malpractice settlement.